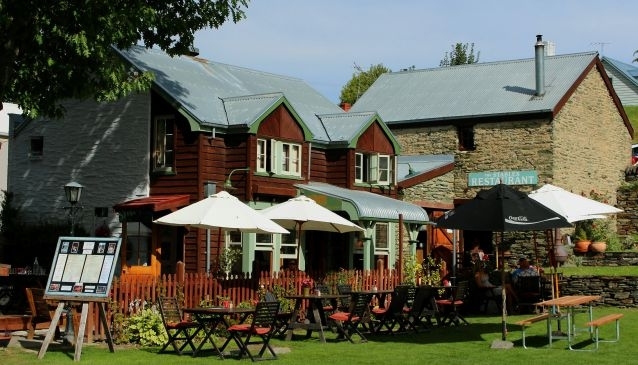 Situated in the centre of historic Arrowtown, the Stables Cafe and Restaurant provides a relaxed an intimate dining experience. The restaurant has bags of character with the building dating back to 1873, and memorabilia of days gone decorating the interior. Indoor and outdoor dining options make the restaurant a great spot to relax and enjoy people watching in Arrowtown. During the summer, its central location means it's a popular spot to enjoy lunches overlooking the green, while in winter the log fires are a welcome treat inside. The lunch menu includes a range of salads, venison burger, fish and chips, steak, pizza, lamb and seafood chowder. The dinner menu includes pork belly, duck breast, venison pie and Southland Lamb. A kids menu is also available.